← So how do you know what day it is when you are retired and living in Puerto Viejo?? Sloths and snorkeling – what could be better?!?!? The last couple of days have been just terrific. Over the last three days there have been two sloths who have visited a tree just a few meters from the house. At first one would come and leave and then the other would come and then leave. 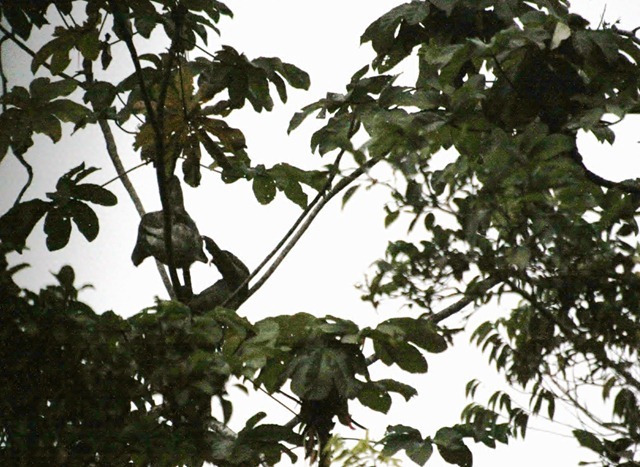 Two days ago they both were in the same tree – very unusual behavior for sloths who are quite solitary. I about died laughing when the male would reach out to touch the female and she would smack his hand away. Eventually she left the tree and went to another. I have to say that I watch these things obsessively. Much like a sloth :-) The picture here is not real clear since I photographing while it was almost dark but you can see the two of them if you look real hard. Yesterday was independence day in Costa Rica and we went snorkeling to celebrate. This was my first time ever and I had a BLAST!!! Even though we did not have fins so could not go too far out on the reef, I was able to figure out how to breath and spent up to five minutes at a time just looking at the reef and the fish. I was not out far enough to see the schools of fish but I saw so many beautifully colored specimens – all quite small except one. Now I absolutely cannot wait to get fins and go out further. I have attached a you tube video to show a quick preview of what I experienced. Obviously not the stunning video you see on TV but for me WAY COOL!! By the way, this was done with a tiny little camera made by Fuji that take both still and video images underwater. AND it cost just a little over $100. Amazing technology these days. I especially love the breathing in the background! This is very cool. I know!! I sound like someone in a scary movie…………. I’m checkng your blog almost every day—I love it! I so envy you the snorkeling!!! My best dreams are of being underwater and not having to come up for air. Haven’t ever done scuba, but Frank has, a little. I’ve given you blog address to quite a few people. Love ya!